signed and on verso signed, titled, dated July 1956 and inscribed "No. 2857"
In 1955, after moving in the spring to his new studio/home in Manotick, Ontario, A.Y. Jackson, along with his friends Professor and Mrs. H.U. Ross, bought property at Twidale Bay on Lake Superior, near Wawa. From his base at a cabin that was built there, he would explore and sketch on the eastern shore of Lake Superior, and it became one of his regular painting places of the time. 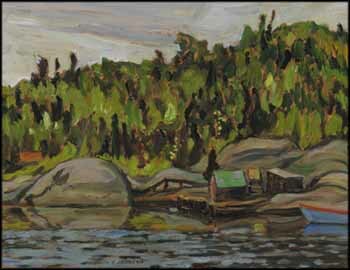 This sketch is a fine example of his depictions of the eastern Lake Superior area, in which he captured brightly painted rustic cabins nestled at the lake's edge amid sculpted boulders, with a colourful boat floating off the right edge of the panel. Jackson created sensations of movement through the diagonal sweep of the clouds that rise behind the trees, the vertical undulation of the trees and the gentle rippling in the water that breaks up the reflections in the foreground. Seen as if painted from a boat, Fishing Shacks, Wawa, Ontario shows how keenly Jackson could make the viewer feel the fresh, alive atmosphere of this place.